Combat games, paintball, laser tag, kids paintball, airsoft. Team building. 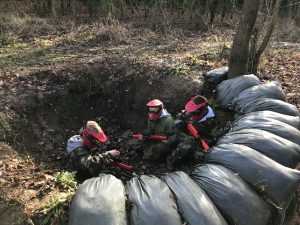 RW Paintball offers a choice of real life combat games across our woodland locations close to Basildon, Bishops Stortford, Canterbury, Dartford, Dorking, Harlow, Longfield, London, Redhill, Sidcup & Southend. Paintball is one of the best outdoor combat games. At RW we offer adult paintball for all players over the age of 12 years. Paintballing is usually a full day experience, kicking off at 9 am and running through until around 3.30pm. Ideal for Stag do’s, Hen do’s, corporate team building and teenagers parties, you can celebrate your occasion with us. If a full day is too much, half day sessions can be arranged subject to availability. 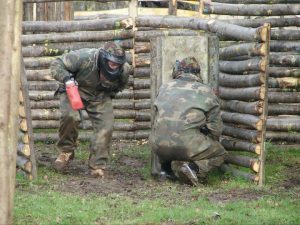 More details on our paintball combat games can be found on our Adult paintball page here. One of the favourite combat games of the moment. Our kids low impact paintball is ideal for 8-11 year olds. It’s played with pump action weapons which slow the pace to make it safe and controllable. A solid 8 games over a 2 hour period. You’ll be hearing the war stories for days after. Find more info on kids low impact paintball here. We offer laser combat games for all ages from 8 years old. Minimum group sizes of 10 players are required and more information on our laser games can be found by clicking here. Airsoft is offered on the last Sunday of the month, usually from one of our Kent sites. It has become more and more popular in recent years and is rapidly catching up with paintballing. You can find more details on our Airsoft page here.